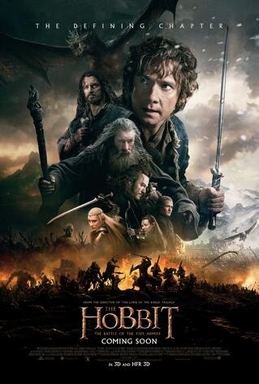 The final film in Peter Jackson’s second Middle Earth trilogy concludes Bilbo’s adventure with the dwarves in a satisfying way, delivering a huge scale battle between all of Middle Earth’s creatures that fills up the majority of the runtime. The battles are well depicted although I can’t help but feel the use of CGI in this trilogy feels a little overwhelming and less seamless than ‘Lord of the Rings’, particularly in the orcs and a couple of fight scenes which feel more like cut scenes from a computer game than a movie. The film picks up immediately after the events of ‘The Desolation of Smaug’ as the titular dragon makes his way towards Laketown to reek havoc on its residents, and this sequence is a thrilling opening that provides Luke Evans ‘Bard The Bowman’ his chance to shine. To a certain extent, this feels more like a prologue, or a cleansing of the palate before the events to come once the dwarves and Bilbo have settled into their new surroundings of Erebor. The film is an enjoyable conclusion to the trilogy, and it feels a lot sleeker as the shortest in the series, but there’s a few issues where I don’t think Jackson quite gets things right. The first is a legacy from the last film, and concerns the ill fated idea to insert Evangeline Lilly’s elf ‘Tauriel’ firstly into the narrative, and secondly to try to shoehorn a love triangle between her, Legolas and Kili, one of the dwarves. It doesn’t feel earned and it doesn’t feel necessary in the wider context. The second aspect concerns Thorin Oakenshield (Richard Armitage), the newly crowned dwarf king, and his troubling descent into paranoia and madness after winning Erebor back. Armitage has been one of the trilogies best performers and he does his best with the material, but his behaviour seems too sudden a change from his mindset in the previous films, and Jackson’s approach lacks any subtlety whatsoever. There’s also the solitary scene at Dol Guldur with the necromancer which doesn’t really lead anywhere (well not until ‘Lord of the Rings’ anyway), although that could be forgiven with a huge battle impending. ‘The Battle of the Five Armies’ (‘There and Back Again’ is still a better title!) is a thoroughly entertaining movie, and despite several missteps delivers a strong finale to the trilogy. As a trilogy, I’ve found ‘The Hobbit’ to be an extremely enjoyable return to Middle Earth. I think the first film is my favourite overall as it spends time introducing the key characters and reintroducing the audience to the setting and whilst Jackson has been criticised for expanding one book into three films, I’ve not felt that the films have been overly slow at any time and I’ve enjoyed them all.